GBB was selected by the City of Fort Wayne, IN, to review garbage and recycling collection programs; provide recommendations/direction for future programs; and oversee/support the procurement and negotiations process with vendors. The City ultimately received bids from five companies, and the Fort Wayne City Council approved four contracts with National Serv-All to collect and dispose of the City’s trash and collect and process recyclable materials for at least seven years. The new collection contract, which includes providing a single container for residents to discard glass, metal, and paper recyclables, has a revenue sharing component that provides the City with half the net proceeds from the sale of its recyclable materials. It was originally expected to bring in approximately $130,000 a year to the City, compared to nothing in past collection contracts. Based on the successful results nine months within the first year of the contract, it was projected to generate $500,000 for the City in 2011. 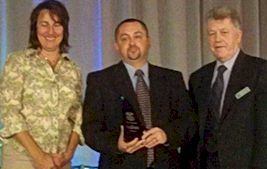 City of Fort Wayne representatives Kira Blacketor, Program Manager of the Solid Waste Department, and Matt Gratz, Solid Waste Manager, receiving the 2012 Gold Excellence Award for Collection Systems from SWANA. In light of this success, the Indiana Association of Cities and Towns (IACT) presented the City two prestigious awards at its annual conference. IACT officials recognized Fort Wayne with the Community Achievement Award for its recycling program and efficiencies that saved money, generated revenues, doubled community participation and reduced residential garbage fees by more than a million dollars. It also presented the City with the prominent Green Community Award, in great part due to the successful recycling program. In June 2012, the Solid Waste Association of North America (SWANA) announced the winners of its 2012 Excellence Awards Program, which recognizes outstanding solid waste programs and facilities from some of the most innovative and dynamic organizations throughout North America. In the Collection Systems category, the City of Fort Wayne finished first with the Gold Award for the implementation of the new collection program.